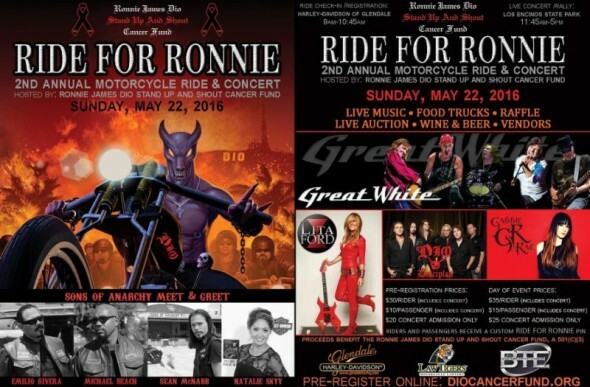 Actor Emilio Rivera (“Marcus Alvarez” on the “Sons of Anarchy” television series) will lead the 2nd Annual RIDE FOR RONNIE Motorcycle Ride and Concert, benefiting the Ronnie James Dio Stand Up and Shout Cancer Fund on Sunday, May 22, 2016. Following Rivera at the front of this year’s RIDE will be a VIP pack comprising of “Sons of Anarchy” actors Michael Beach (“Taddarius Orwell ‘T.O.’ Cross”) and Sean McNabb (“Tacoma-VP”) as well as Wendy Dio, Ronnie James Dio’s widow and co-founder-president of the Dio Cancer Fund, rocker Lita Ford, who will also perform at the concert following the RIDE, Frank Kramer of KLOS Radio’s popular “Heidi and Frank” morning show, and “Boston” Tom Foresteire. Forestiere will ride the one-of-a-kind “Holy Diver” Harley-Davidson motorcycle he won at the recent Street Party that launched this year’s RIDE. It is custom-painted with the illustration from the cover of Ronnie James Dio’s iconic “Holy Diver” album. Riders will assemble for a continental breakfast at Harley-Davidson of Glendale with kickstands up at 11AM. The RIDE will take them through the streets of Los Angeles County to Los Encinos Park in Encino, where they will be treated to an afternoon of live music, raffle and live auction, various food and merchandise vendors and more. The Inaugural Ride, held in May 2015 as part of a weekend of events commemorating the 5th anniversary of the passing of Ronnie James Dio, contributed to raising $155,000 for the cancer charity from that weekend’s events. The “Sons of Anarchy” cast members will also participate in a Meet & Greet at Los Encinos Park during the afternoon events. Rivera, Beach and McNabb will be joined for the Meet & Greet by actress Natalie Skyy, who played Kiki on the popular series. Emilio Rivera, whose acting career spans some 25 years of roles on television and in films, including the Oscar-winning “Traffic,” is an avid motorcyclist and supporter of charitable motorcycle events. His upcoming projects include the films “Badsville,” “Better Criminal,” “Fade Away” and “Smartass.” Michael Beach is also a familiar face on television, with appearances on “The Blacklist,” “Secrets and Lies,” “Blue Bloods” and a pivotal role on the critically-acclaimed series “ER.” In addition to his string of acting credits, which include theatrical productions and appearances on television’s “NCIS Los Angeles” and “Community” as well as “Sons of Anarchy,” Sean McNabb is well-known as a rock musician who has played bass guitar with Quiet Riot, Dokken and Lynch Mob, among others. Natalie Skyy made her pro Mixed Martial Arts debut as a ring girl with Strikeforce in 2008, which led her to serve at her 2nd MMA fight night collaboration with the Texas-based MMA show, “Shark Fights.” Her new film “3 Days” is slated for a 2016 release. Gourmet food trucks will be on site at the Park throughout the afternoon. Among the participating food trucks will be Slammin Sliders, G’s Taco Spot and Archie’s Ice Cream. Premium beer sponsored by Ninkasi Brewing Company will be available as well as wine, soft drinks and water courtesy of Solar Rain. An array of merchandise-t-shirts, caps, CDs, wristbands, event souvenirs, etc.-will be available for purchase, and a “Jumble Sale” booth featuring gently-used items and collectibles benefiting the Dio Cancer Fund will be also on site at the Park. Additional vendors are being finalized. A live auction will be held during the concert that will include a B.C. Rich guitar signed by Ronnie James Dio, Rob Halford (Judas Priest), Bruce Dickinson (Iron Maiden), King Diamond and Geoff Tate and a custom-made “Cut” leather motorcycle vest with a set of specially-embroidered Dio Cancer Fund patches. Additionally, there will be a raffle for a special limited edition ASG Vision Motörhead white-body guitar with the “Ace of Spades” graphic and other items. Additional RIDE FOR RONNIE sponsors who are helping to make this year’s event possible include Harley-Davidson of Glendale, Bigg Time Entertainment, Production Resource Group (PRG), Law Tigers, Mates Studios, Clair Global Audio, Monster Energy Drink, Brittany Foundation, Western Bagel and Starbucks (San Fernando Road, Glendale), among others. The Ronnie James Dio Stand Up and Shout Cancer Fund was formed in memory of the legendary rock singer Ronnie James Dio, who lost his life to gastric cancer in 2010. A privately funded 501(c)(3) charity organization dedicated to cancer prevention, research and education, the Ronnie James Dio Stand Up and Shout Cancer Fund has already raised over $1 million. Monies raised have been committed to the cancer research work of the T. J. Martell Foundation for Cancer, AIDS and Leukemia Research, the gastric cancer research unit of the M.D. Anderson Cancer Center in Houston, where Ronnie was treated for gastric cancer during the last six months of his life, and other cancer research projects. The recent passing of several high profile musicians to cancer has served to reinforce the commitment of the Dio Cancer Fund to support research and education that furthers early detection, prevention and treatment of prostate, colon and gastric cancers.